Depeche View shows all source code of a folder in one window, searching everything as you type, or by clicking on words. 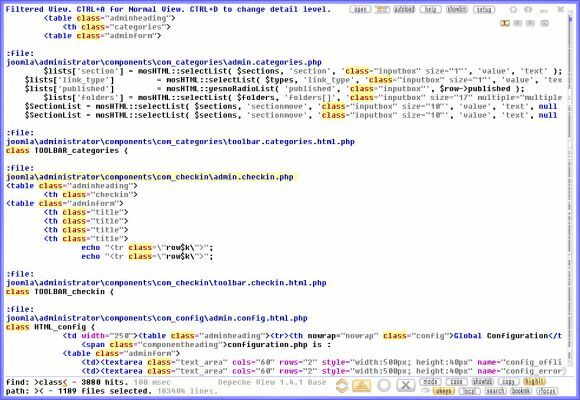 It is used for source code analysis, supporting instant repeated searches across thousands of files. Example: searching the word "class" in a 1000 files PHP project. 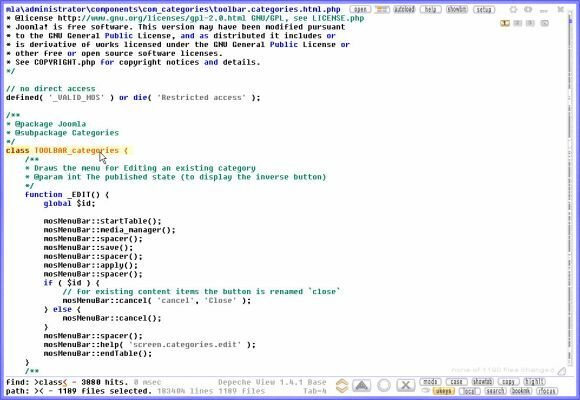 Software developers need to search huge amounts of source code every day, to copy, modify and adapt existing functionality. With Depeche View, you start by loading all content of a directory tree, like some Open Source project, into memory. Then simply type a word. Instantly, you land at the first ocurrence, within the first source code file. In most cases, you then see another word which you want to search next - for example, there is a function name, but who is calling this function? Simply SHIFT+click on the word, and it is searched again. This way, you can examine dependencies like a call stack within a minute, without the need to compile or debug anything. Depeche View allows to analyze huge Open Source codes without any upfront efforts: just load the stuff, then search it instantly. Example: clicking on a line in the previous screen shows the text at that place. Depeche View XE also comes with an integrated text editor, allowing to edit text instantly. This way, you can fly over your project's sources, and whenever you are at a relevant place, have another click and change text instantly - faster than in any IDE. Depeche View Base is freeware and can be downloaded here.